By the Bay Gallery is celebrating our 30th year in business on the Embarcadero in Morro Bay! For over three decades, we continue to offer the best selection of high quality, American-made crafts and fine jewelry anywhere on the Central Coast. Whether it's art glass, custom jewelry, wood, ceramics or enamel sculpture, we sell unique, fine quality crafts and provide exceptional personal service. Please visit us at 895 Embarcadero, at the foot of Harbor Street. 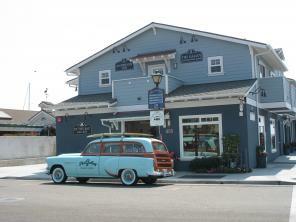 We share a building with The Galley Restaurant and The Anderson Inn. Or shop our secure website which is constantly updated with the latest work. Please "Like" us on Facebook ... Thank You!